← Shattering the Matrix with James Bartley, Satanic Ritual Abuse, Reptilian Hosts and Hybrids. Posted on June 18, 2014, in Baal-Peor Demon Worship, Baby Lisa Irwin Case, Bible Figures, Book of Revelation, ISIS, Sorcery, spiritual warfare, What's Urgent? and tagged ISIS, ISLAM, Maleficient, One World Religion, Queen of Heaven, Queen of the Damned, Semiramis, The whore of Babylon. Bookmark the permalink. Comments Off on ISIS- Islamic State of Iraq and Syria- NOT!!! 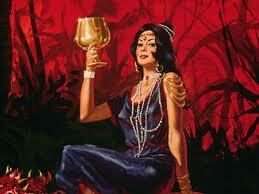 A Spiritual Study of ISIS- Queen of Heaven, Whore of Babylon.